Mohammed Abdul Wahab (†1990) had a very special sound of his own. He tried to create a new amalgamation between East and West so as to be educational for the Arabian ear as well as keeping the quarter tone and Arabic scale that turned them on artistically. 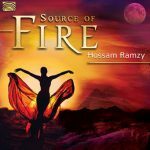 Hossam Ramzy, also an innovator in the field of world music, discovered that the compositions of Mohammed Abdul Wahab had been one of the first forms of World Music.